Microsoft is blocking the mails from my VPS, is there something I can do about this? If you're sending e-mails from your VPS to a Microsoft domain such as @hotmail.com or @outlook.com and you receive a bounce-message about a blockade on their network, Microsoft will have placed your IP-address on their blocklist. Your IP can for example be added to the blocklist if some IP-addresses send spam (even if for a shorter period of time) and an IP-range including your IP is then added to the blocklist. Use the form on Microsoft's website. Send an e-mail from your VPS to delist@messaging.microsoft.com and request the delisting of your IP (only works for @live.com/nl or @hotmail.com/nl adresses. It can take 24-48 hours before your IP is removed from the blocklist after Microsoft confirms honoring your delisting request. The delisting form will ask you to supply some personal information as well as information related to the blocked e-mail. 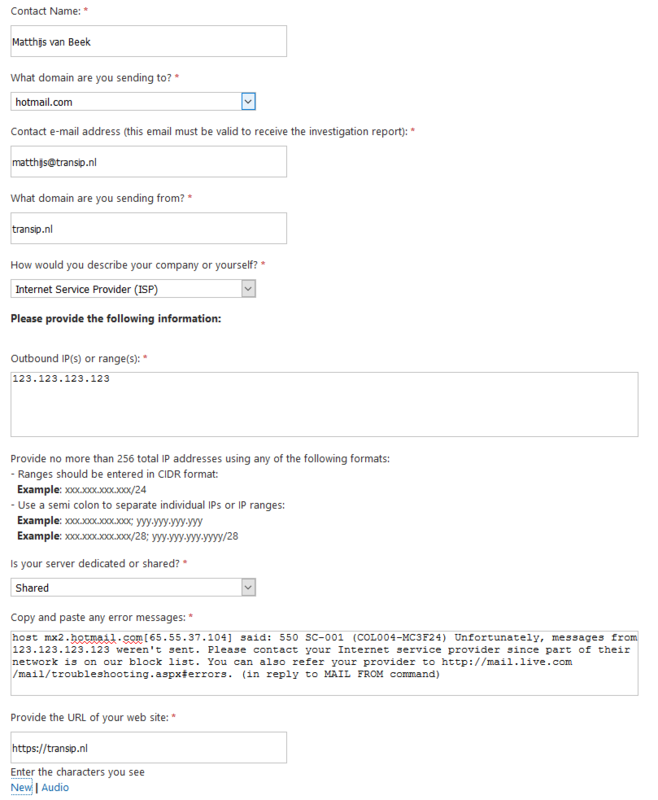 An example of a filled form is shown in the screenshot below. Contact name: Your own name. What domain are you sending to: Select the extension you're mailing to, e.g. @hotmail.com or @outlook.com. Contact e-mail address: Your own e-mail adress. What domain are you sending to: The domain from which you've sent the e-mail that was blocked. How would you describe your company or yourself: Select the option that best describes your company. Often this will be 'other'. Outbound IP(s) or range(s): Provide the IP of your VPS. Is your server dedicated or shared: Your VPS is dedicated, but if your VPS' IP is used for multiple domains, select shared. Provide the url of your website: As the describtion suggests, provide your own / company's website url.